Stair railings today have several functions. 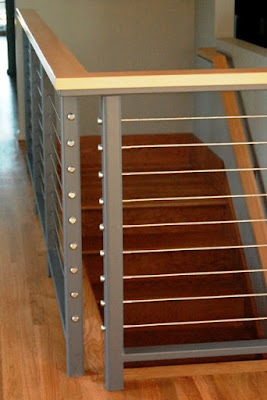 Of course, the primary task of stair railings is a security for inhabitants and guests of the house. The second function of interior stair railing involves giving the interior decoration. Let's try to understand the variety of stair railing ideas and types, identifying the most successful options for staircase designs in houses and apartments. First of all, we will focus on security issues of the interior stair railing. In this regard, immediately to keep in mind: according to existing rules and regulations of the stairs, three or more than three steps must have staircase railings (guard) with a minimum height of 90 cm. 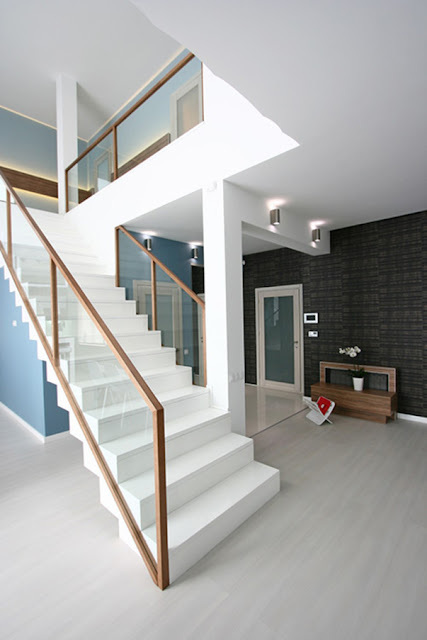 If the width of the 3 stairs is more than 1.2 meters, the staircase should have stair railings on the sides, If you have children in the house you have to install balustrade on the interior staircase railing, which consists of vertical supports and handrails (balusters) in increments of no more than 15 cm. The appearance of the staircase, of course, is determined by its fence. 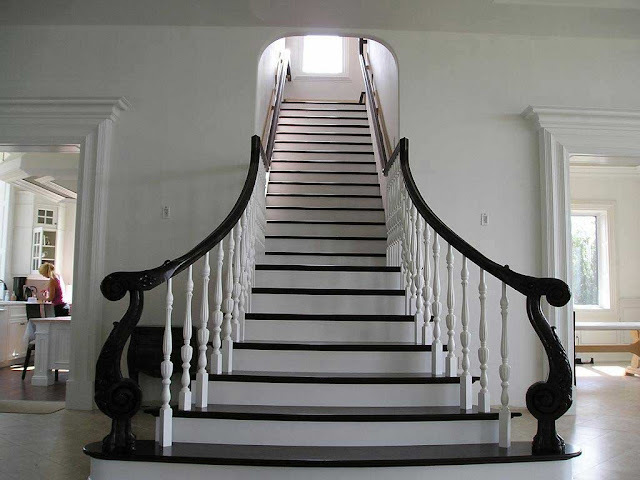 The stair railing ideas should be not only durable but architecturally impressive and simply beautiful. These design elements are the main decorations of the stairs. Here the flight of the interior stair railings design ideas is usually limited only by financial capabilities. 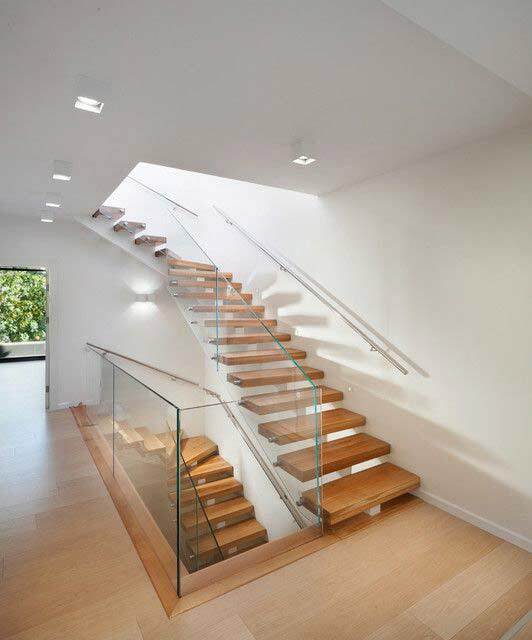 Stair railings are divided into two groups: for exterior and interior stairs. The outdoor stair railing is regularly exposed to external influences, in particular - atmospheric. Their material and designs have to be more stable. The simplest and cheapest solution - the concrete stair railing systems. These stair railing ideas are more suitable for any country. In most cases, the outdoor stair railings are made of metal, concrete or natural stone. Wooden stair railings and balustrades had an absolute popularity in the middle of the last century, they are now used less and less. Most of the wood is suitable for the manufacture of handrails, some other are used as decorative elements as interior stair railing ideas. For present staircases, it is advisable to use oak, beech, mahogany. wrought iron stair railings are used now perhaps the most widely. The most simple and cheap staircase railings consist of handrail and uprights connected by welding. Metal can be used from simple pipes or fittings to the profiles of different configurations. Then, the wrought iron stair railing parts are covered with paint. We get a few primitive, but quite reliable design. 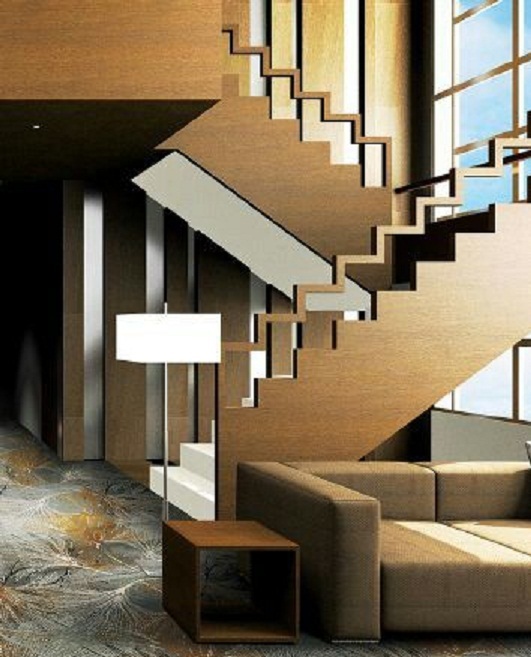 At the same time they can be used in any staircase type: wood, concrete, stone, metal. However, the adaptability of the metal and modern methods of treatment allow making various stair railing ideas and designs. 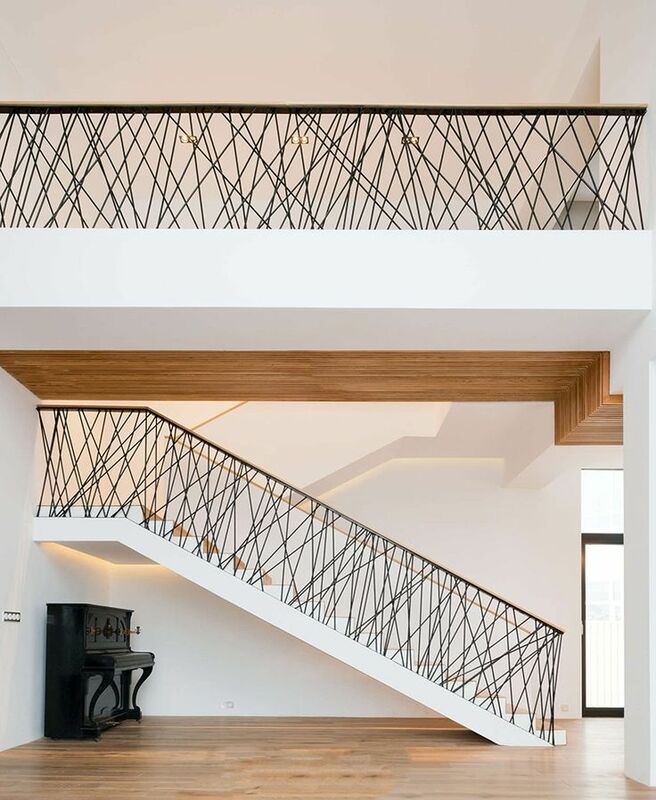 For example, intermediate parts in the staircase railings can be installed not only vertically, but also parallel to the axis of the flight of stairs, and even at some angle. In recent years, Stainless steel is increasingly used for the interior stair railings to get a strong staircase railing, It is not necessary to additionally be painted. Stainless steel has a long service life, it is quite resistant to environmental effects and relatively inexpensive. Stainless steel is successfully combined with other materials of the outdoor and the interior stair railing. It should be noted that ferrous metals for stair railing designs can be subjected to electroplating - chrome plating, nickel and so on. However, in this case, it is applied during assembly welding, as the high temperature of the arc damage the coating. The connection is made using the machined nuts and flanges, which, however, can also be given a decorative form. 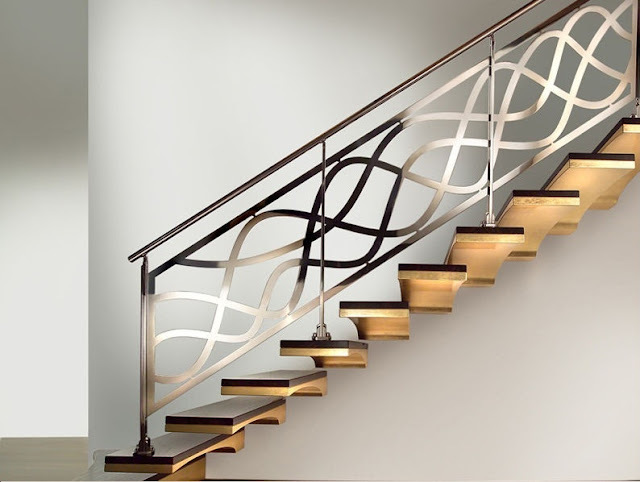 Metal staircase railings are currently made from a wide variety of metals. The widespread railing of aluminum and its alloys. This high tech material is light and looks very attractive. Brass is less frequently used for outdoor and interior metal stair railing. Although, of course, brass staircase railings look very attractive, they should be in harmony with the whole interior design. Besides, brass requires constant maintenance, since it is oxidized faster and become darker than, for example, aluminum and stainless steel stair railings. A special beauty, even sophistication, can be achieved by filling the gaps between the various elements of the uprights. 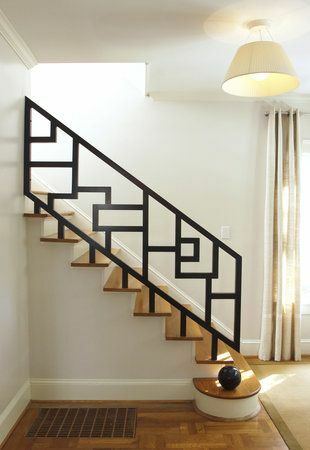 For example, metal patterns, ornamental stairs give a unique flavor. As masters say, wrought iron stair railings give pleasing to the eye and soul. Stamped metal is the cheapest option. It's usually used in a weight construction. 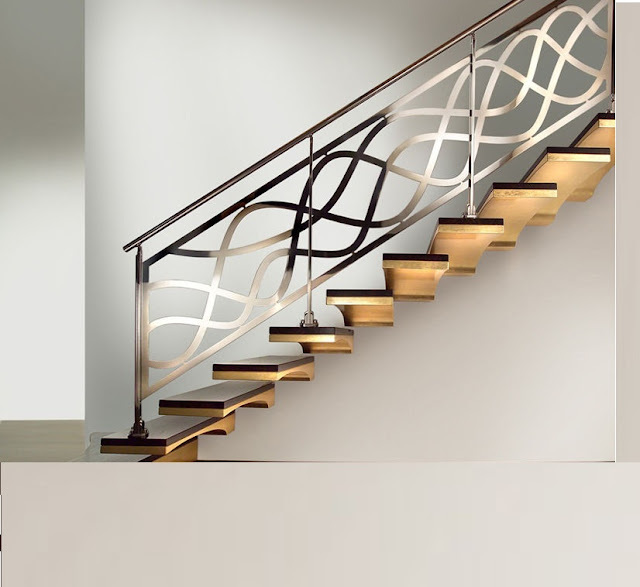 Although modern methods of stamping and further processing of metals allow this method to create a beautiful and decorative outdoor stair railing ideas. 3. Accordingly, the handrail must be offered from the bottom to accommodate the strip of the metal stair railings. Recently manufacturers developed a completely new system of modern stair railing systems with metal wires. 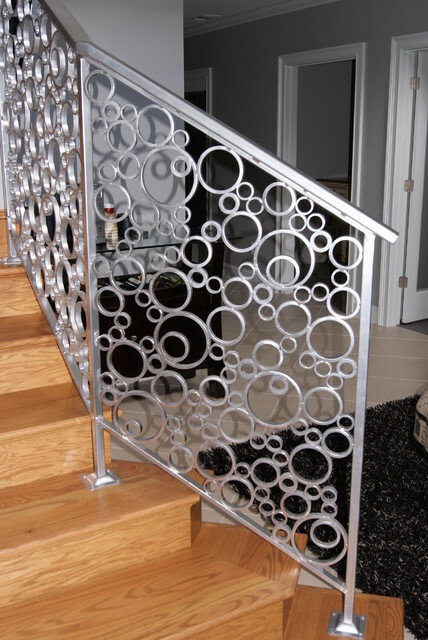 This is the most stylish solution in modern stair railings designs. The design creates a surround like an additional pattern that is different from the basic design of racks and handrails. It consists of the following: vertical racks with halls every 900-1200 and stretched metal cables. And they have arranged either parallel to the modern staircase railing, or they can be an independent pattern. The diameter of the cable is typically 3-6 mm. Moreover, the wires can be made of galvanized or stainless steel. The stretching in the wire of the stair railings is made by a device of various types of Tensioner. Today more and more people are becoming fans of the glass stair railing system. as We should pay attention to get the "golden" combination of aesthetics and safety? 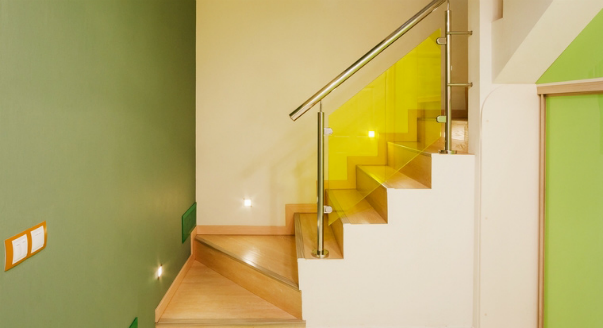 which glass type is used for modern stair railings? 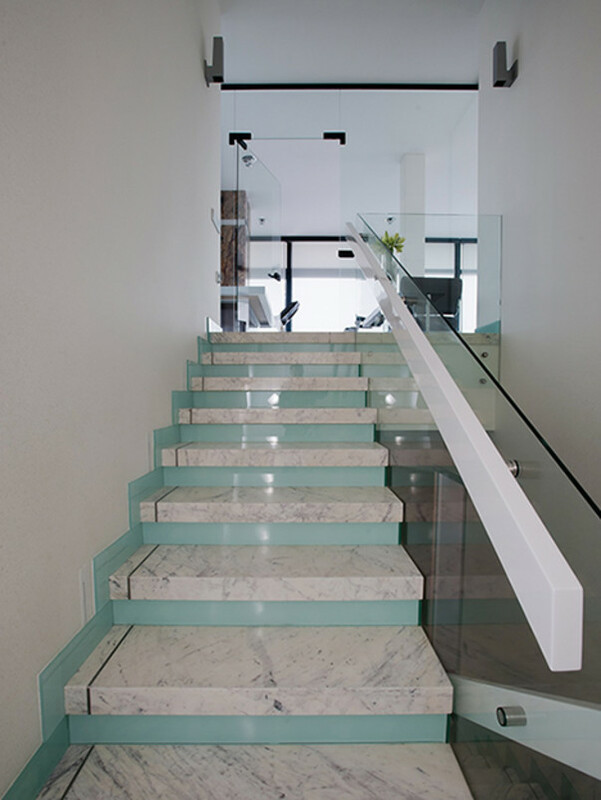 Polycarbonate and acrylic glass is stable and non-friable compared with the conventional silica glass as modern stair railing materials. Disadvantages of these materials are that they are quite soft and therefore easily susceptible to scratches. Triplex laminated cracked glass, but the pieces are not scattered in different directions but remain on the adhesive layer. This reduces trauma in case of emergency. The greater the number of layers in this glass, the stronger and safer it is. Fluid glass. To obtain bending glass stair railing: a glass sheet is heated to 600 degrees, which makes it flexible, allowing to implement different designs. Molten glass sheet under its own weight spread on the desired surface without losing the integrity and smoothness. Bending allows us to produce a glass railing system for any modern stairs designs, even the most intricate shapes of modern stair railings. The corners of the glass sheets of the glass stair railing should not be chipped and the edge of glass stair railing system must be smooth.